Phasma, IMO, is one of the coolest movie villains that no one really knows anything about. She has had about 10-15 minutes of total screen time across two (2) movies, with about 5-6 lines of dialogue that add nothing to the storyline; but she looks awesome and has an obvious air of mystery surround her chrome-plated armor. When I saw that Delilah Dawson had written a full-length novel about Phasma, I knew that I had to get my hands on it and dive in as soon as I had some time to kill. Phasma (Journey to Star Wars: The Last Jedi) is about, you guessed it, Captain Phasma. The chrome-plated, ruthless stormtrooper that took everyone by storm when she first appeared in trailers for The Force Awakens. Who is she? Where did she come from? Well, now we have a novel to tell you just that, kind of… The novel starts out with a Resistance spy, Vi Moradi, being captured by the First Order and sent for interrogation by a red-armored trooper known as Captain Cardinal (I’m assuming he is one of the Crimson Guard, but not quite sure). Its obvious from the get-go that Cardinal has some real hatred for Phasma and, since he can tell from Vi’s logs that she recently visited Parnassos (Phasma’s home planet), he figures that he can prod answers about Phasma’s history from this smuggler. What ensues is a lot of flipping back and forth between 10-12 years ago (Phasma on Parnassos and her road to the First Order) and Cardinal zapping Vi for more information that will get Phasma erased. But will Hux believe anything Cardinal says, or is Phasma in too deep? 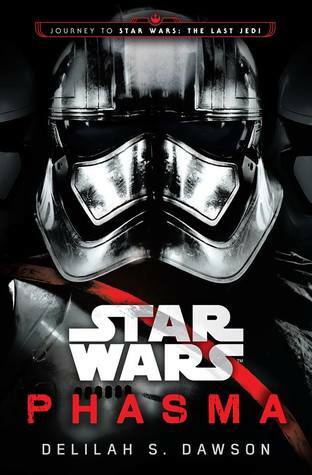 All in all, Phasma was a good read (3.5ish stars) made better by January LaVoy’s audiobook narration. On top of the sound effects and music that accompany it and most of the other Star Wars audiobooks, Lavoy almost perfectly captures Gwendoline Christie’s voice in every Phasma scene which kept a smile on my face. She also provided perfect pacing and her male voiceovers were actually pretty spot on; definitely need to keep her name on my list and I recommend giving the audio a shot if you decide Phasma is one of your next reads. Let me know what you think when you finish! Overall I enjoyed it, but was just expecting more.